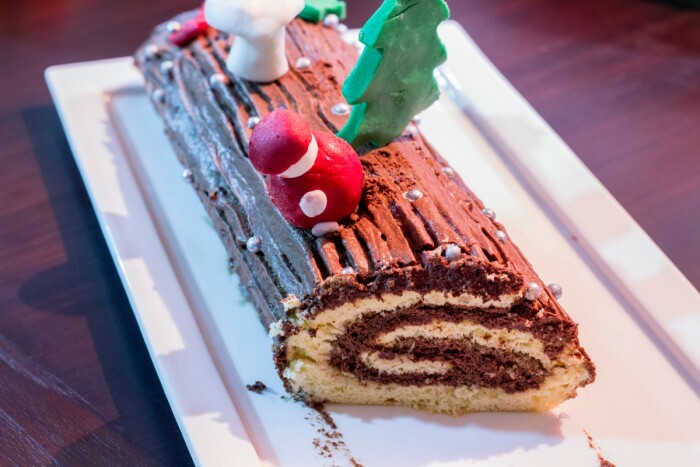 The typical christmas cake in France is definitely this one. But you can find many many sorts, with all sort of taste and all as imaginative as it could be. The one I did with my mum that came for 4 days was only a chocolate one, simple but yummy. I didn’t do the typical butter cream on top as it’s too heavy. 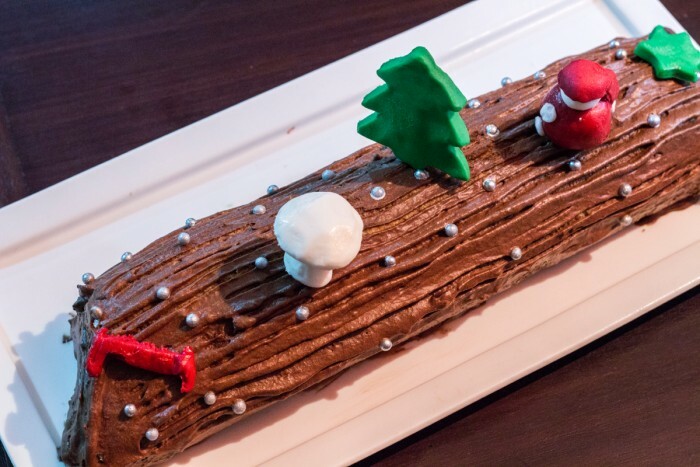 Could have done a light frosting but I simply covered it with mousse au chocolat, which is the same as the inside filling. 1. Start by the mousse to get it hard and fresh for the filling. Melt the chocolate with the water and milk in a bain marie (you can also just do it in the microwave). Whisk the whites together with a pinch of salt and reserve. Wait for the chocolate to be less warm and mix the yolks inside making. I don’t put chocolate but you can add if your chocolate is not a good quality one. Then incorporate the white into the chocolate by making sure to fold it and not break them. Reserve in the fridge. 2. Start the cake. Whisk the whites until firm. In an other bowl, mix the yolks and 125g of sugar, add the flour and vanilla sugar. Incorporate the white eggs. Pre heat your oven at 180°C. Spread the mixture on a baking tray, about 1cm thick, making sure it’s well spread and even. Cook for 10mn, make sure it doesn’t get brown and over cooked. Remove from the over directly after it’s cooked, put on a rack with a wet kitchen cloth. 3. Meanwhile, prepare a sirop to wet the cake. It can be anything, with alcohol or without, just with sugar or with a flavour. I did it with 100g of sugar, 50ml of water and added strawberry flavoured. Cook for 20mn until it starts making a thick sirop. Spread over your cake with a pencil, don’t be afraid to put enough so that your cake won’t be too dry. Once done, put a plastic kitchen film on it and roll the cake slowly being careful that it doesn’t break. It shouldn’t if you follow carefully. Reserve the rolling cake you got with the wet kitchen cloth on top and put in the fridge. 4. After about 1hr, unfold the cake, apply the chocolate mousse heavenly and starting rolling again softly. 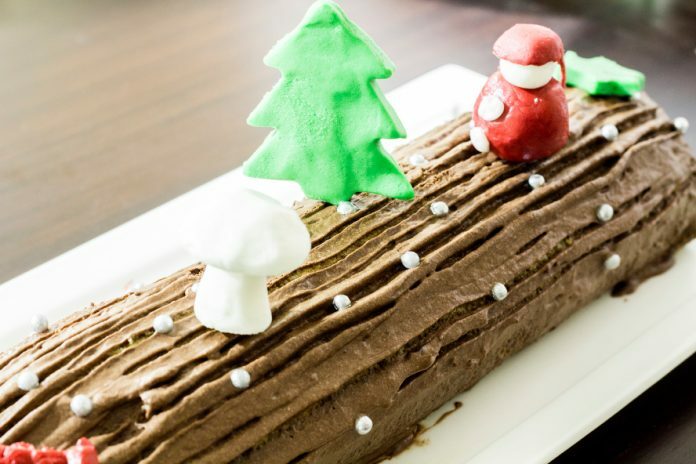 Once finished, you need to apply chocolate mousse on the top and around and make some lines with a folk on top, so that it looks like a tree trunk. Keep in the fridge until served. Enjoy.